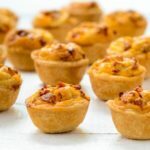 Make these mini chorizo and cheese quiches for brunch or when you are entertaining or tailgating. They are a wonderful appetizer to start your celebration. Heat oven to 375 degrees F. Lightly grease 24 mini muffin cups. Remove and discard casing from chorizo. Finely dice the sausage. Heat oil in a small skillet over medium-high heat. Add diced chorizo and cook until browned. Remove from heat to cool to room temperature. If using homemade dough, roll out thin (between 1/8- and 1/4-inch). Use a round 2 1/2-inch cutter to cut 24 rounds from the dough. Press 1 round into bottom and up the sides of each muffin cup. Divide cheese among muffin cups (about 1 to 1 1/2 teaspoons per cup). Top each with green onions then cooked chorizo. Whisk together eggs, cream, salt, and nutmeg. Spoon evenly into crusts. Bake for 25 minutes, or until lightly browned. Cool 2 minutes. Use the tip of a knife to lift quiches from cups.